Whats laser cutter machines advantage? 1. Lower power consumption: a typical blanking press or turret punch consumes 50kW of power in total. A 4kW laser system uses 10kW of power total typically. 2. Safety: A blanking press has a large blade that moves rapidly up and down, and doesn't necessarily have safety features to prevent a hand getting caught in it. A fiber laser is required to be enclosed by a light tight box which means they are designed to run without human intervention during cutting. 3. Material Scrap savings : Due to a cutting tool requiring material on either side of the cut, a border of at least 1/2 inch is required. For a laser a laser cutter machines, if parts share a common outline, they may be cut with a single cut, with no scrap. A minimal scrap skeleton may also be cut, as small as 1/16 of an inch or even less for some materials. 4. Cutting properties: a blanking die can only cut materials up to a maximum tensile strength. A laser can cut any strength of material, as long as the material can be melted. 5. Low maintenance: A blanking press or turret punch has expensive tools that must be sharpened and stored regularly as different parts are cut. A laser can change parts by changing programs, and requires relatively inexpensive replacement parts like lenses and nozzles. 6. Flexible operation: A traditional blanking line has a tool for each part that is a fixed design that is very high investment, typically costing somewhere on the order of $50,000 per tool, depending on the shape. A turret punch is somewhat better in that you can program any shape that can use that set of smaller shapes to make something, but if you want to change a dimension on a hole or something of that nature, design change is limited to the tools available, or a new tool must be purchased and it must replace an available slot on the turret. These tools are less pricey, but still require regular maintenance, which is a somewhat specialized task, so the labor costs will be higher. 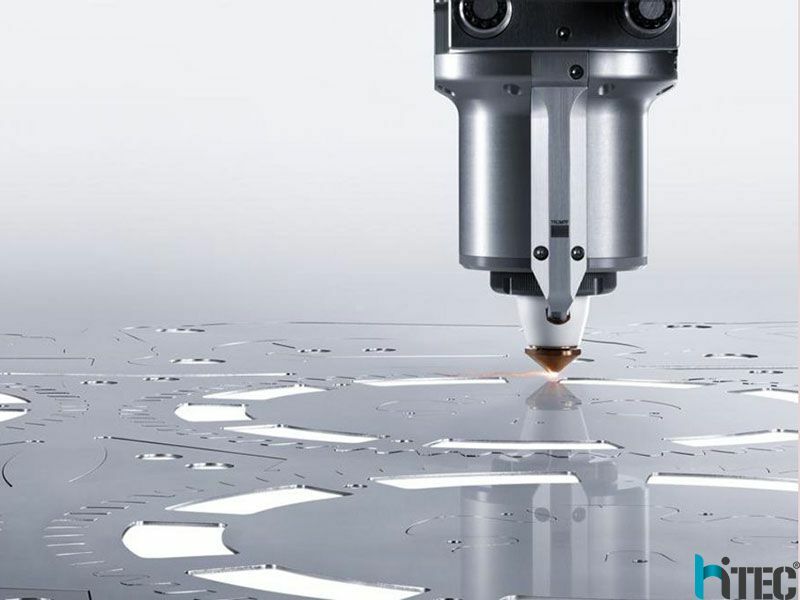 A laser can change the cutting profile on the fly, and typically takes less than an hour to reprogram, costing approximately $60 to apply a change, and that is a high estimate of the cost. 7.Improved edge quality: Since presses and punches are shearing through the material, which literally stretches the edge until it breaks, the top side of a part typically has a rounded over edge, while the bottom has a bunch of stretched ribbons that are very sharp. These are sometimes required to be cleaned off with an abrasive, which is a secondary process that adds to price. A laser, when properly focussed and set for a material, cuts a part with an edge with a mirror-like surface, the top edge remains square, and the bottom edge is smooth to the touch. 8. Faster changeover: A blanking press requires 30 minutes to change between cutting different parts, as the dies must be swapped out. A laser cutter can change programs instantaneously, leading to time savings and allowing for smaller production runs to have a decreased price. One slight negative to laser cutting lies in its method of profiling a shape. A blanking press cuts one whole part outline at a time. A turret press cuts one hole or edge for a part at a time. A laser must trace the entire part outline to cut a part. This slows the process somewhat, and causes the time to part completion to be longer. Still, for every 2 blanking lines, 3 laser lines can produce the same output. This means that since a blanking press costs $10 million, and a similar laser costs $2million, the investment in an additional machine still results in a lower price. More laser cutter machines information,Pls check HITEC CNC Website. Next : what is the 3D autofocusing laser marking machine?